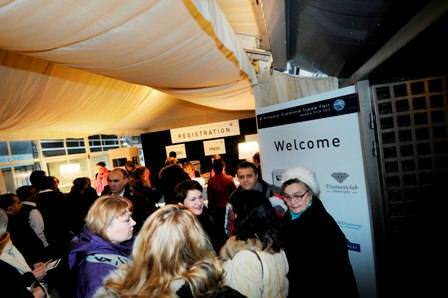 The fourth edition of the Antwerp Diamond Trade Fair opened today in Antwerp, Belgium. With scores of visitors waiting in line to collect their badges at the registration desk, foot traffic in the corridors of the Antwerp Diamond Bourse and the Diamond Club of Antwerp was strong, turning the exhibition booths of the 83 participating companies into beehives of activity. "We knew that this year’s fair would be busy since we have invited close to 300 buyers," said Raphael Rubin, a senior member of the ADTF Organizing Committee. "When you add in those buyers who were invited in previous years, and choose to come back to visit the ADTF, you have a full house. This year, we’re also welcoming buyers’ delegations from Greater China, Europe, the Middle East, and other regions," he added. For Oscar Garcia Escamilla from Barcelona, the fair is a perfect fit. "I have just struck out on my own as an independent diamond buyer, after working in wholesale and retail for more than a decade. This fair is an excellent introduction to a great number of suppliers. This certainly will not be my last visit to Antwerp," he said. Katy Frevre-Biache, of Emmanuel Esch Company of Luxembourg, said the fair was a great opportunity to find a rich selection of goods. "Antwerp is relatively close to us, and we come to the city quite often on business trips. But this fair’s formula enables us to see a lot of companies, inspect an enormous selection of goods, and all in a very short time span which is the perfect mix for busy businesses. Just great!" Meanwhile, Jorge A Lievano, a high-end jeweller from Bogota, Colombia, said he was very impressed with the concept and its execution. "It’s a very elegant event, and well organized," he stated. Lievano said the invitation to participate in the fair had come at the right moment as he is looking to broaden his diamond inventory, and hoping to forge relationships with a number of Antwerp suppliers. The ADTF will close on Tuesday, January 30.